There is air in the pulmonary artery! This is an air embolus (probably iatrogenic from the IV contrast injection). Turns out there is also some air in the right ventricle. Keep air embolism in mind as a very rare complication to imaging with IV contrast. This patient has four devices. 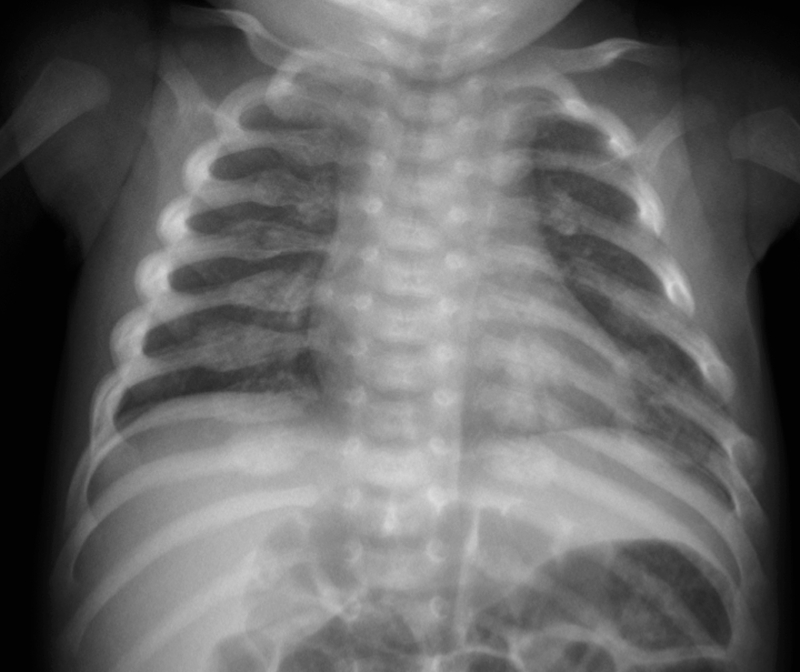 There is an endotracheal tube that is malpositioned into the right mainstem bronchi. Coursing up from the femoral area is a REBOA catheter. What is a REBOA catheter? REBOA = Resuscitative Endovascular Balloon Occlusion of the Aorta. It is relatively new technology in which a specialized catheter is used with a balloon that occludes the aorta. It is predominantly used in lieu of cross-clamping the aorta for severely ill trauma patients with uncontrolled abdominal hemorrhage as a temporizing device to allow time for transport to the OR and definitive control. The patient’s lungs also appear with contusions and possibly a posterior hemothorax (patient is supine) on the left. On the AP view the fracture is subtle; the distal end of the proximal 5th phalanx looks irregular and lacks a solid radial side. On the lateral it is more obvious. The fracture line appears to have travelled obliquely and it almost looks like there are two distal phalanx! The distal portion of the finger is dislocated at the PIP joint. Deep venous thromboses are thought to occur in as many as 1 in 1000 people annually1, although many instances never present to urgent care or emergency room settings. When a patient does make it to the ER, the most common presentation is a swollen, tender lower extremity. Although there are many things on the differential, the emergency room physician must rule out DVT because of the potential risk of subsequent pulmonary embolism. Ultrasound has become the go-to method for evaluation of DVT. In the ER setting, the limited compression ultrasound technique is most widely used due to the ease and speed at which it can be performed. A duplex scan with color Doppler can be useful in other scenarios, but these evaluations can take up to an hour, require a skilled technician, and have not been shown to be any more accurate in detection of proximal DVTs compared to limited compression ultrasound2. Limited compression ultrasound frequently targets two main locations for DVTs: the common femoral vein and the popliteal vein. The ultrasound is typically done using the linear or vascular probe (6-10 MHz), which was designed for imaging vessels, but has the added benefit of being flat, which helps with uniform compression when assessing for DVTs. During the ultrasound exam, is important for the leg to be in a dependent position, which will allow for ideal assessment during compression. This can be achieved by putting the patient in reverse Trendelenburg, or by having them partially seated with 30 degrees of hip flexion. Start by palpating for the femoral artery in the groin crease, which will allow you to easily locate the common femoral vein, which lies just medially. Hold the probe in transverse orientation, so that you can see the cross-sections of both the artery and vein. Follow the vessels distally, looking for the common femoral vein to bifurcate into the superficial and deep femoral veins approximately 6 cm from the inguinal ligament. Look closely at the branch points, as these are common areas for thrombi to form. *A note about the nomenclature: the superficial femoral vein is actually a deep vein, and thrombi are much more common in the superficial femoral compared to the deep femoral vein. The superficial femoral vein is sometimes referred to as simply the femoral vein. Follow the superficial femoral vein as it becomes the popliteal vein, and then passes behind the knee. Scan about 5-7 cm distal to the popliteal crease – thrombi distal to this are very unlikely to generate threatening emboli. The vein should be just superficial to the artery as you follow the popliteal vein and artery near the knee. As you are conducting the ultrasound you will apply pressure approximately every centimeter with the probe. As pressure is applied, the vein should start to compress, with the anterior and posterior walls eventually coming into contact. The pressure needed to completely collapse the vein should not disrupt the architecture of the femoral artery. If the vein does not completely collapse, or if the pressure necessary becomes so great that the artery becomes distorted as well, there is likely a thrombus in that segment of the vein. Scan proximally and distally from that point to examine the extent of the thrombus. Below are two ultrasound images of the superficial femoral vein (blue) and femoral artery (red). The image on the left is without compression. The artery is superficial to the vein, and the lumen of the femoral vein is slightly larger than the artery. These characteristics help with identification. The image on the right shows the same vessels during compression with the ultrasound probe. The artery is now very ovoid and almost flat, while the vein is still round, and the lumen shows some, which represents a thrombus. Silverstein MD, Heit JA, Mohr DN, Petterson TM, O’Fallon WM, Melton LJ 3rd. Trends in the incidence of deep vein thrombosis and pulmonary embolism: a 25-year population-based study. Arch Intern Med.1998;158:585-593. Lensing AW, Prandoni P, Brandjes D, Huisman PM, Vigo M, Tomasella G, Krekt J, Wouter Ten Cate J, Huisman MV, Büller HR. Detection of deep-vein thrombosis by real-time b-mode ultrasonography. N Engl J Med.1989;320:342-345. Theodoro D, Blaivas M, Duggal S, Snyder G, Lucas M. Real-time B-mode ultrasound in the ED saves time in the diagnosis of deep vein thrombosis (DVT). Am J Emerg Med.2004;22:197-200. A 4-week-old girl was brought to the ED with right thigh swelling after reportedly getting caught up in the restraints of her car seat. Lower extremity radiographs revealed a healing right femur fracture, as well as multiple fractures of the left lower extremity. In light of these findings, a complete skeletal survey was performed. Look at the chest radiograph below. Other than the striking number of fractures that you see, what else do you notice about them? The various posterior rib fractures are in different stages of healing. For example, the left 3rd through 5th posterior rib fractures (red, below) appear most acute, while the left 7th-9th ribs (blue) show some degree of healing. The rib fractures on the right side (yellow) show more substantial callous formation (2nd through 9th, and 11th). Unfortunately, these findings strongly suggest that this patient was the victim of non-accidental trauma (NAT). There are many radiographic findings suggestive of NAT, but some of them are more specific than others. Now, let’s take a closer look at the lower extremity fractures that were initially discovered. These are classic metaphyseal fractures, which we just learned were some of the most highly specific findings for NAT. 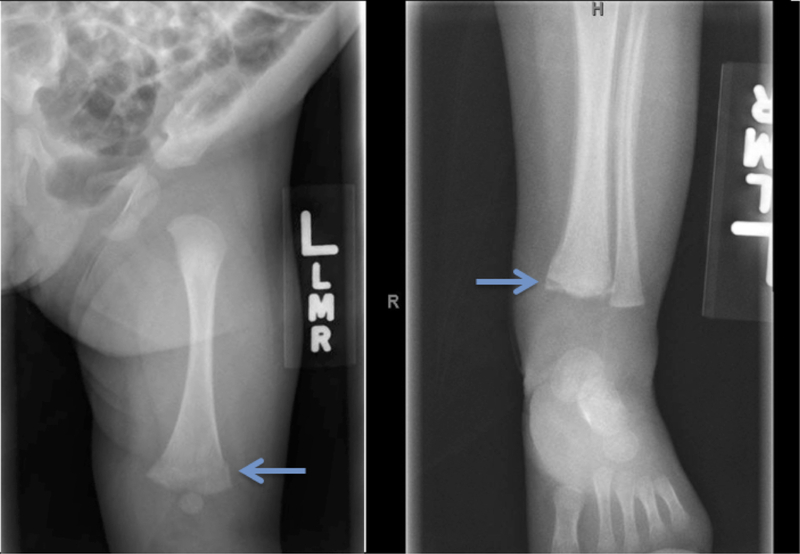 The child has a healing metaphyseal fracture of the right distal femur. There is also a metaphyseal fracture at the right proximal tibia. The left distal femur shows an acute transverse metaphyseal fracture. Metaphyseal fractures are also seen involving the left distal tibia. Finally, notice the periosteal reaction along the shafts of the left tibia and fibula, right lateral distal femur, and right fibula. It should be noted that it is very important to rule out other potential causes of such fractures, like Vitamin D deficiency or osteogenesis imperfecta, since a diagnosis or even the suggestion of NAT will bring about a wide range of social, economic, and legal consequences. The images and fracture patterns above are not all-inclusive for NAT as many fractures can occur. It is imperative that physicians utilize their clinical index of suspicion along with radiologic imaging in search of NAT. Jayakumar P, Barry M, Ramachandran M. Orthopaedic aspects of paediatric non-accidental injury. J Bone Joint Surg Br. 2010 Feb;92(2):189-95. doi: 10.1302/0301-620X.92B2.22923. Review. PubMed PMID: 20130307. Johnson K. Skeletal aspects of non-accidental injury. Endocr Dev. 2009;16:233-45. doi: 10.1159/000223698. Epub 2009 Jun 3. Review. PubMed PMID: 19494670. Ng CS, Hall CM. Costochondral junction fractures and intra-abdominal trauma in non-accidental injury (child abuse). Pediatr Radiol. 1998 Sep;28(9):671-6. PubMed PMID: 9732490. Leventhal JM, Thomas SA, Rosenfield NS, Markowitz RI. 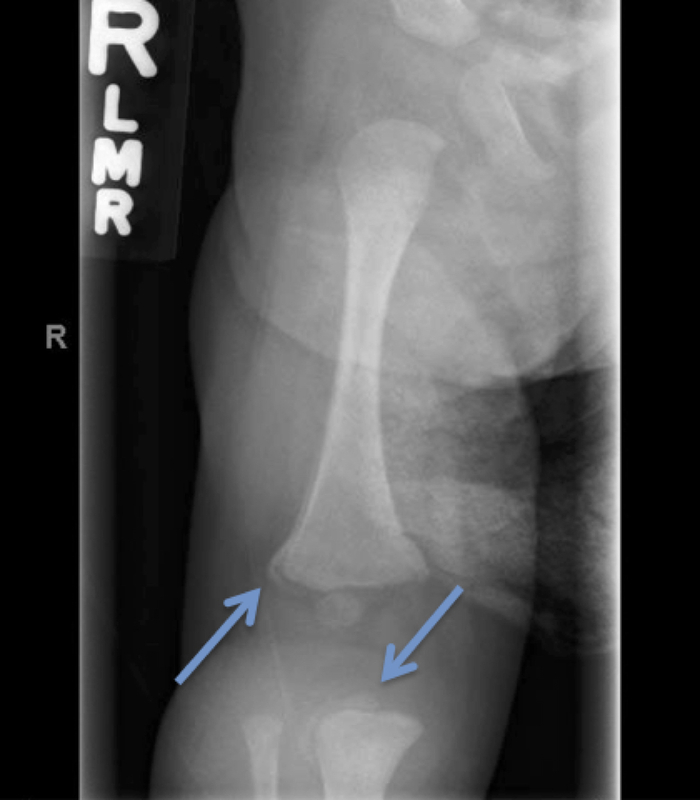 Fractures in young children. Distinguishing child abuse from unintentional injuries. Am J Dis Child. 1993 Jan;147(1):87-92. PubMed PMID: 8418609. Peritonsillar abscess (PTA) is one of the most common head and neck infections that is diagnosed in the emergency department. The common presenting symptoms are a muffled/altered voice, throat pain, fever and odynophagia. A non-contrast CT image of a particularly severe example of a PTA is shown below. The next horizontal cut image is below, with red arrows to highlight the abscess. One of the more striking aspects of the image is the large degree of airway compression, with the maximum measured diameter of the airway being 2cm. Also, the first image shows that the abscess has two distinct “pockets” that eventually coalesce. To backtrack, this particular patient initially presented with symptoms of fever, chills, dysphagia, dysphonia and trismus. On examination, there were thin tonsillar exudates, erythema and deviation of the uvula. A diagnosis of peritonsillar abscess was made without imaging and the patient underwent incision and drainage, given antibiotics and discharge. The above images were taken after the patient returned to the ED several days later with continued, worsening symptoms. The options for imaging of a soft tissue infection of the head and neck include CT and ultrasound. In the ED setting, ultrasound is becoming more and more utilized as the preferred imaging modality. However, this patient received a CT because they failed therapy. CT is superior to ultrasound in differentiation between peritonsillar abscess and other infections of the oral cavity and pharynx. It also allows clinicians to determine the degree of airway compromise. Other indications for CT imaging in suspected peritonsillar abscess include: uncertain diagnosis, obstructed view through physical exam or suspicion of an associated infection such as peritonsillar cellulitis. 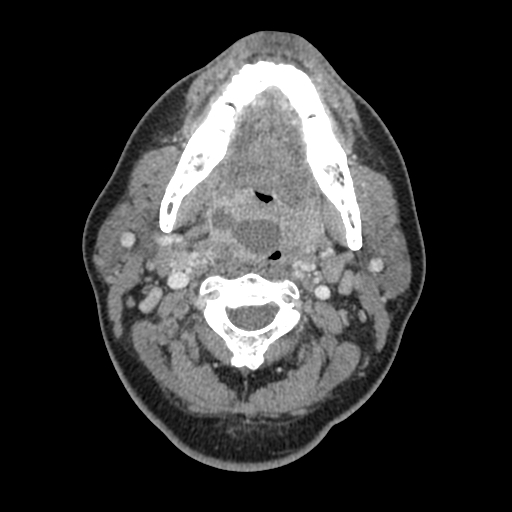 Overall, peritonsillar abscess is one of the most common soft tissue infection of the head and neck that is encountered in the emergency department. Most of the time, the diagnosis is clinical. Ultrasound is the preferred imaging modality, but CT is useful in a variety of situations as well. Powell, J. and Wilson, J.A. (2012), An evidence-based review of peritonsillar abscess. Clinical Otolaryngology, 37: 136–145. 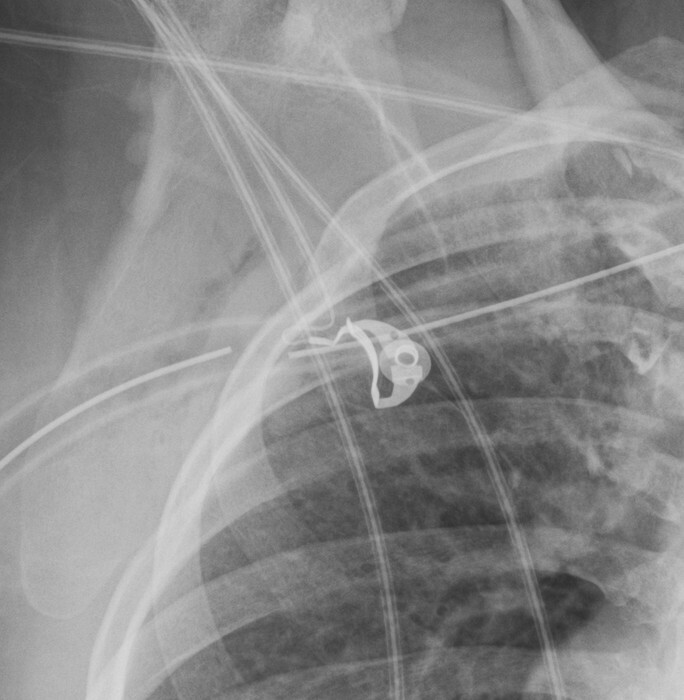 The patient’s chest tube is not inserted far enough. It is also a bit high residing between ribs 3-4. 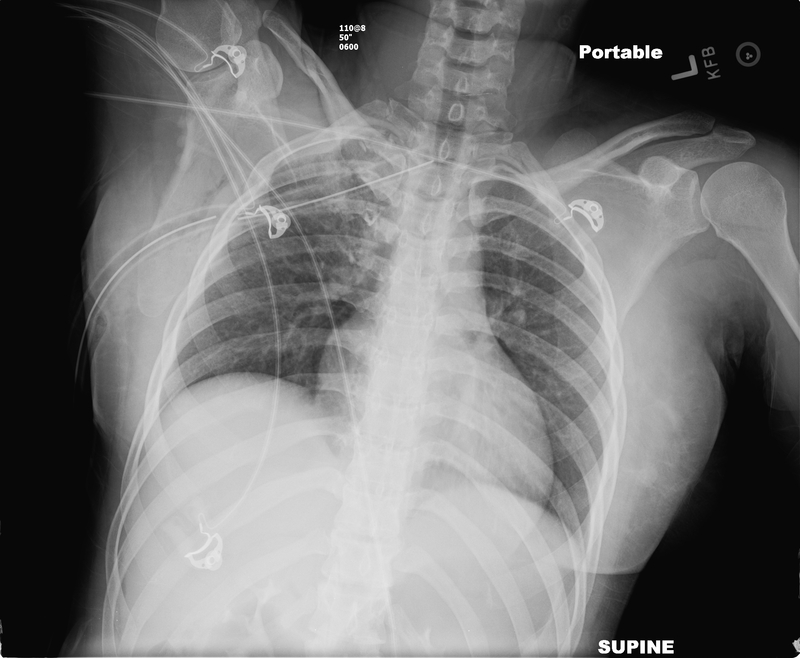 Chest tubes have a side port and a distal port for suctioning fluids, air from the pleural space. There is a radiopaque line seen on the tube that is interrupted at the side port (see magnified image). In this case the radiograph shows that the side port is subcutaneous and not inserted all the way into the pleural space. The chest tube needs to be replaced!